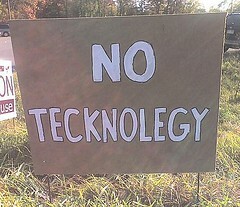 Intellectual Poison: No Tech for You! Sometimes I wish I could have the say-so authority to just take away some users computers entirely. They are either repeat offenders of clicking on virus pop-ups that infect their computers over and over again or they are just unclear on basic computing concepts and practices. These aren't bad people by any stretch and I realize that, to many people, computers are a necessary evil. One cannot work effectively today without some basic computing skills. And large organizations would be advised to be proactive in addressing user education by providing training classes, maybe even mandatory training classes since skills range very widely from utter neophyte to supreme guru. And there's no more cost effective process than preventative education. Anyway, my shining example of an end user that could definitely use a refresher course or five recently took place. Somehow, in the course of using her computer, she replaced her original signature file with, brace yourself, the text from a Nigerian spam email. I don't know how, I don't know why and she has no insights into how it could have happened except that it must have been a hacker. And so, each and every email she was sending was automatically appended with the Nigerian email. Which convinced her that her computer was under the control of a master mind hacker or somesuch. The fix was, as you'd guess, simple. I deleted the signature file, made up a new one with her actual contact info and saved it. Done. If this was only an isolated incident then I'd probably not even bother writing this up. But I get these events on a regular basis. Users unclear on what is happening reacting to error messages (usually just clicking them closed without reading or writing the numbers down for me) and then re-interpreting what they see happening through their faulty lens of non-tech knowledge. Much of my job is merely wading through the nonsense information to get to what is actually not working. It is sometimes funny but much more often it is like being led down a path while blindfolded and there are branches growing out in the path to jab you in the face on the way by. Not so much fun, eh?